These are the perfect pair of everyday earrings that can be worn with virtually any outfit – from the most casual to more glammed up events. Buy a good quality pair that will not hurt sensitive ears, especially if you plan on wearing these almost every day. Any simple gold earrings would look great but I love the small details that knot earrings would give to an outfit. 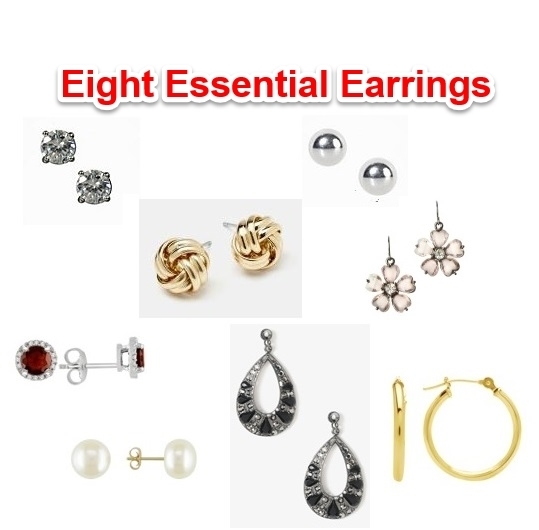 These are another pair of earrings that can be worn with a variety of outfits. Pick a gold-tone that best compliments your skin tone and your other gold jewelry. I personally prefer to wear silver tone to gold tone jewelry, so these are perfect for everyday wear (do you see a theme here so far?). My problem with earrings is that I can never find ones that I can wear for more than a few hours without them irritating my ears. Even sterling silver earrings irritate my ears after a day of wear. I will just have to keep looking or save up for the real thing. Choose a pair of earrings in your favourite spring/summer and fall/winter accent colours for days when you do not want subtle earrings. I choose to show a more casual option for laid-back spring and summer and a more glammed up version that is perfect for holiday parties. (Faux) pearl can instantly give a more sophisticated vibe to a more simple or casual outfit. There are many options for pearls, including crystal accents, but I prefer my pearls simpler because I feel it makes faux pearls look for genuine. Statement earrings are perfect for updos and for elegant, dressier events. Choose a more neutral design for maximum versatility or choose one corresponding to a certain outfit. Just remember to keep your necklace simpler or wear no necklace at all to prevent your jewelry looking too over the top. There is nothing more classic than a pair of gold hoops. They are perfect for casual days when you want to wear your hair up. 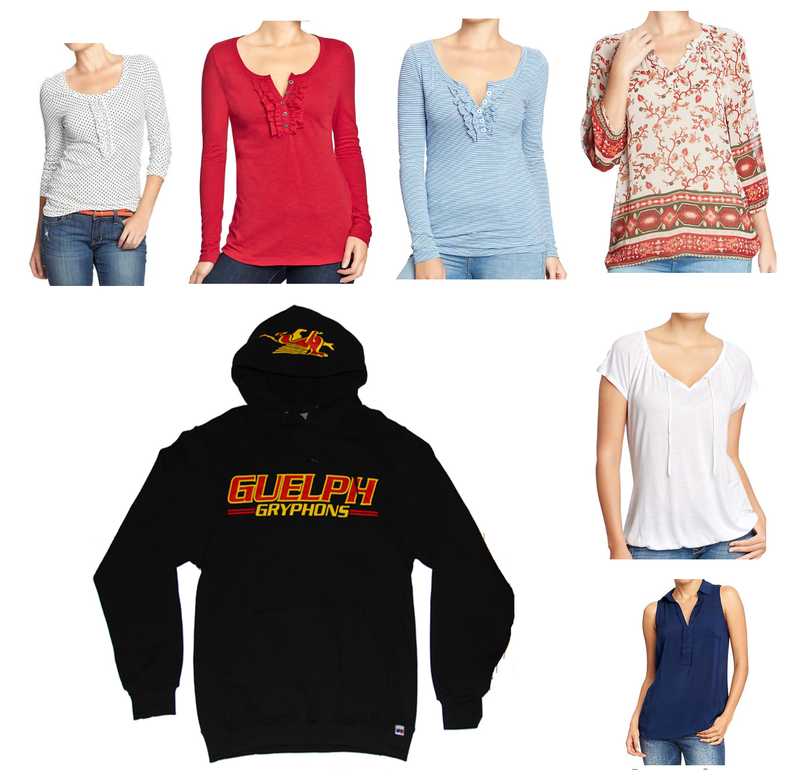 They come in a variety of sizes and designs so pick a size and design within your comfort level. Scarves are a fabulous accessory that serve a purpose while still being fashionable – they can add a pop of colour to an outfit, add warmth against the elements in the fall and winter and against the air conditioner in the spring and summer, and they can tie together an otherwise awkward colour combination. Most scarves are fairly inexpensive which means that you can build a collection of them quickly without breaking the bank. As your scarf collection grows focus on finding a good balance of solid pieces and colourful patterned ones. If your closet is filled with mostly solid basics then play with classic or quirky patterns. If your closet is filled with patterned pieces then accessories with simple, solid scarves. 1. The Neutral Pashmina like this black one from Top Shop – Pick in your favourite neutral colour to wear with brighter shirts in the fall or to use as a shawl when you want to make a sleeveless dress more conservative in the summer. Choose a dressier fabric for maximum remixability. 2. The Knit Infinity or Circle Scarf like this black snood from Top Shop – Pick a neutral colour that coordinates with your fall and winter weight jacket. I prefer circle scarves over long rectangle scarves for winter because they provide warmth without the fuss of having to worry about ends getting caught on items or looking awkward with an outfit. 3. The Spring Solid like this peace one from Old Navy – Choose a light colour that coordinates with your spring and summer pieces made in a breathable fabric. An ivory or a pale colour is my choice of colour for fall because they can lighten up a darker outfit in early spring and be used as a light weight shawl inside in the summer. 4. The Fall Solid like this red one from Old Navy – Choose a colour that coordinates with your fall and winter pieces that also compliments your skin tone. Red is my colour of choice for fall because it can be used to add a pop of red to holiday outfits in December. 5. The Animal Print like this leopard one from Ardene – This scarf should be in a medium weight – not too heavy for spring but not to light for the fall and winter. It is great for adding a print to an outfit or solids or for tying black and brown pieces together in a way that might otherwise look awkward. My two prints of choice are leopard print or giraffe print. 6. The Floral like this pink floral one from American Eagle Outfitters – Another scarf that should be light weight and breezy. This one is perfect to wear to jazz up more basic pieces without adding to much weight. One of these would look stunning tied around your head as a DIY headband. 7. The Multi Coloured Print like this horse print one from Old Navy – Pick a patterned scarf with a variety of colours (primarily ones that you already have in your wardrobe). This scarf is great for inspiration for tying together a multi coloured outfit and looks great with shoes in a coordinating colour. When I first moved to college two years ago, I brought all of my favourite handbags. Of those ten handbags, I only ended up using about four of them because most of my bags served the same purpose. Also, attending an Agriculture college in a small town meant I spent very little time coordinating my bag perfectly to my outfit because no one really cared how put together you looked. My experience may be a little extreme, but it taught me that when it comes to handbags and minimal storage space, you only need the very basics. If I were returning to residence this year, I would only bring: a crossbody bag, a wristlet, a backpack, tote bag and a satchel purse. Each of these bags give a different look and serves its own distinct function. 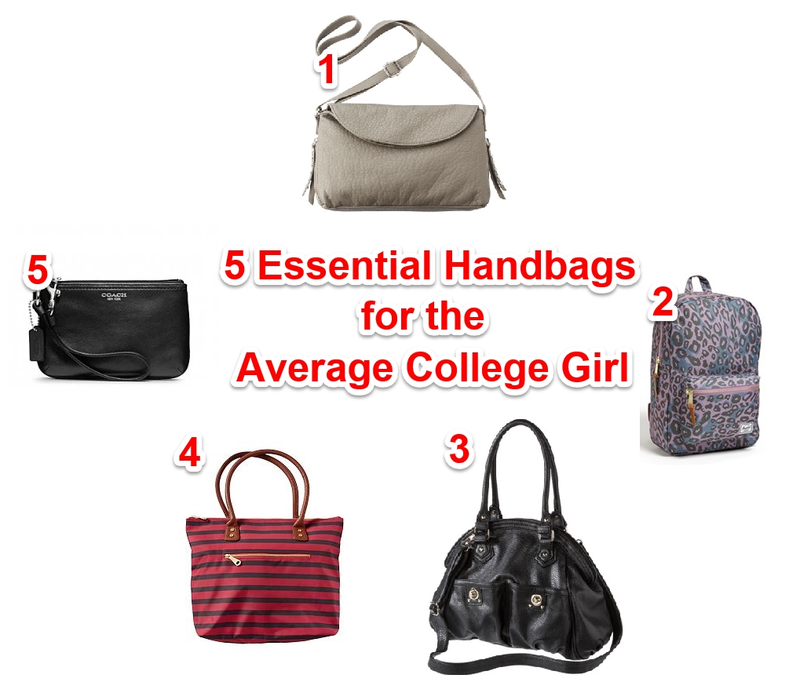 I used to be an advocate for larger purses – I love being able to toss everything I need into one bag. It was not until summer school this year that I realized the benefit of a crossbody bag. They are perfect for quickly stuffing into a backpack during the class and are light on my shoulders. Bring this in a neutral or in a signature colour for sports games, amusement parks, or for other hands-free occasions. It goes without saying that as a student, you will need a backpack. Backpacks are a classic, proven way to carry your heavy books, binders, and all the supplies you will need. Bring this in a classic neutral to get years of use out of it or buy in a fun, playful pattern. Just make sure that it is large enough to fit a couple of binders and your largest textbook. For when you need a little more bag room, you can not go wrong with a classic satchel. Store a cardigan or scarf in your bag for your cold early morning classes or keep your agenda with you at all times. Go with a medium sized satchel for maximum storage capacity but in a compact form. Feel free to splurge on this item in a neutral leather or faux leather – you want a good quality bag that will last you for many years. A tote bag is perfect for those days when you only have one or two classes – you can carry your books and supplies while still looking stylish. Buy a tote bag that is large enough to fit at least one binder, your largest textbook, and your basic supplies. This is where I have fun with my bag wardrobe and choose the whimsical prints or vibrant colours. I love updating my small bag collection each semester with a new, fun tote bag. A simple black wristlet is THE perfect bag for going out. Not only does black go with almost everything, but the compact size means allows you to bring your essentials without carrying a more casual bag. Choose a classic design that is large enough to fit your phone, keys, cash, and your essential cards. This is another bag that I would splurge on if I found the perfect one – just make sure to opt for a wristlet rather then just a basic clutch. Such a small bag is easy to misplace if you put it down on a table or beside you when you are sitting – and with your social-life necessities with you, you do not want to lose this! What are your top five handbag essentials? What bags are you bringing with you to college or what bags would you bring if you had a do-over? Let me know in the comments below!